Getting rid of MBS faster and shifting to short-term Treasury bills will be on the list. 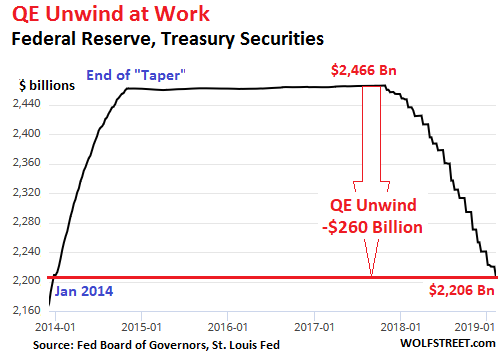 According to the Fed’s plan released when the QE unwind was introduced in 2017, the Fed is scheduled to shed “up to” $30 billion in Treasuries and “up to” $20 billion in MBS a month for a total of “up to” $50 billion a month. So how did it go in January? The Fed sheds Treasury securities by allowing them to “roll off” without replacement when they mature. It does not sell them outright. When Treasury securities mature, the Treasury Department transfers money in the amount of face value plus any outstanding interest to all holders of those securities. Treasuries mature mid-month or at the end of the month. As part of its QE, the Fed acquired residential MBS that were issued and guaranteed by Fannie Mae, Freddie Mac, and Ginnie Mae. Holders of MBS receive pass-through principal payments as the underlying mortgages are paid down or are paid off. The remaining principal is paid off at maturity. These pass-through principal payments cause the principal amount of a portfolio of MBS to decline on an ongoing basis. To keep the balance of MBS from declining after QE had ended, the New York Fed’s Open Market Operations continued purchasing MBS in the market. When interest rates fall, and mortgages get refinanced in large quantities, and in a period when home sales volume is high, and a lot of mortgages get paid off during the sales process, MBS principal can shrink rapidly. But a rising interest-rate environment produces sharply lower refis; fewer mortgages get paid off to be refinanced. And when home sales volume falls, as is the case right now, even fewer mortgages get paid off. Under these circumstances, the pass-through principal payments to MBS holders slow to a trickle. The Fed books MBS trades at settlement, which lags the trade by two to three months. Due to this lag, the amount of MBS on the current balance sheet reflects trades from late last year. In October, the cap for the MBS roll-off rose to $20 billion. But pass-through principal payments and the amount of maturing MBS does not reach that $20-billion cap every month. And hoopla erupted on Wall Street this year when the Fed said that it would be “patient” with interest rate hikes in the first half of 2019, and that it was open to tweaking the balance-sheet normalization process. The big theme was to get rid of MBS faster and replace some of them with short-term Treasury bills to bring down the average maturity of the Fed’s portfolio and give it more flexibility. This, our Wall Street pundits interpreted to mean that the Fed had made a “U-Turn” and would soon cut rates and restart QE at any moment, or whatever. Or three, will the Fed tweak the roll-off – as a slew of Fed governors have suggested – to where it would get rid of its MBS more quickly by outright selling them; and by replacing some of them with short-term Treasury bills to lower the balance sheet’s average maturity, which currently is over eight years. So, what (if anything) happens to mortgage rates if we suddenly have the fed selling their MBS? If they lose their implicit government guarantee, then they get a haircut in the market. But so far Congress guarantees them as Freddie and Fannie are under receivership by the govt. Thank you for fhe reply. That commitment was made at origination. My question is regarding the influx of the MBS back into the market. Specifically, will these actively performing MBS cause a demand for a higher yield for the newly originated MBS? If so, I would think the rates would increase for those either buying or refinancing. That seems like a pin being placed into the housing balloon forcing the prices to adjust to the reality within the local market. That was a topic in the this weeks Wolf report. I am just not sure if my assumption is correct. Positive for some, negative for others, depending on the side of the trade you’re on. It would put upward pressure on long-term rates and mortgage rates, and relieve some upward pressure on short-term rates. Yield curve might steepen. Is there a bid for mbs for the fed to sell to? Right now there would be. These are good securities, guaranteed by the US government: Ginnie Mae is part of the US government, and Fannie Mae and Freddie Mac are in receivership — and they issued and guaranteed the MBS. “There are no bad bonds, only bad prices”. A defaulted bond is a very bad bond. Why does it matter whether the Fed sells treasuries or MBS? Both are government guaranteed, so I would expect both instruments to have the same interest rate, all else equal. Admittedly, I’m no bond expert. I guess if the Fed shifts to selling more MBS, which are longer term in nature, it could have more impact on long rates. It probably matters to the Fed as they seem to prefer holding only Treasuries in their books. It also is a way to reduce duration. I would speculate that the big traders on Wall Street who would rather not see a big selloff are very concerned about the possibility of a yield curve inversion. We got really close, but it didn’t quite invert, and they would rather not see big headlines announcing an inversion and the “inevitable” recession to follow. So, all things being equal, they would prefer shorter term rates to go down, and longer-term rates to stay the same or go up, if interest rates have to go up to satisfy the hawks. Since mortgages are on the longer end of the spectrum, 7 to 10 years, a rise in mortgage rates influences the longer-term part of the curve. If the funds received from selling MBS are used to buy shorter-term treasuries, it will put downward pressure on that end of the yield curve. Of course, Wall Street will squeal if mortgage rates go too high and threaten to unleash a wave of foreclosures, but they are pretty confident that the Fed will be very sensitive to that, after the 2008 debacle. Anyway, my guess is that all of this is to make the yield curve look nicer to those trying to keep the investment dollars flowing. MBS and Treasuries are different. Prepayment risk on agency MBS can be thought of as an embedded call option that requires a spread, i.e. OAS, above the Treasury curve. For non-agency paper, the OAS is even greater relative to agency because it also includes a credit risk component. Mr. Richter, if the Fed trades long-term MBS for short-term treasuries, do you think their real goal is to steepen / “normalize” the yield curve without having to accelerate the shrinkage of the balance sheet? The flat yield curve has to be driving them nuts and may even be the primary reason they want to ‘patient’ on fed funds so they dont invert the curve. I think it could have that effect of steepening the yield curve and raising mortgage rates a little. But this all in slo-mo stretched out over years. So the effects would not be huge and sudden. But the real goal is to just get rid of the MBS for a slew of reasons. They’re a hassle, and their pass-through principal payments are not predictable. It takes a long time to clear trades. The market is not nearly as liquid as the Treasury market if they want to move larger positions. And with them, the Fed is giving official preference to one type of credit, but not other types, and this has been a big complaint. This whole exercise is just smoke and mirrors show to try and hide the fact the Fed’s QE is outright monetisation of the Federal government’s debt! 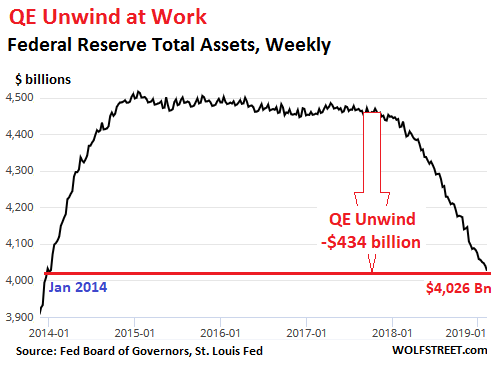 The Fed will never completely unwind it’s bloated balance sheet! It is all just a clown side show as it has always been since 1913! Oh, look at the squirrel over there! Tomorrow the central bankers will do the only thing they know! Create more credit/debt out of thin air! Looks like the central banksters are setting us up again as they have done since 2008/9 (ZIRP, QE1, QE2, Operation Twist, QE3) with a “slow as you will” increase in rates effectively since 2017, with a trail balloon on NIRP. Wolf, does the fact that this is not emanating from the wall street but from the horse’s mouth so to say mean that is the likely policy when we have the next downturn? This is an outlier paper from a researcher at the SF Fed. They produce tons of outlier papers here. Almost all of them are completely ignored. “Zero lower bound” is as far as the Fed is willing to go. NIRP is catastrophic for the banks. And ask yourself who the Fed is working for. Bingo! Really the only question you need to ask, and the answer has been obvious for quite some time. Boom, bubble, bust. Wash, rinse, repeat. Only it’s not a true “bust”… Were it a true bust things would get priced to market value (a.k.a. price discovery). As it stands now there is a concerted effort to shelter the people with the largest balance of assets from risk. I.E. if you have enough vested interest, we’ll make sure you are made whole. This is the fundamental problem with the current monetary policy. We borrow from the future to shelter the privileged, period. Correct. It can’t unwind its balance sheet “completely.” The Fed has had a balance sheet from day one, loaded with assets and liabilities from day! And over the many decades, the assets and liabilities have grown with the size of the economy and with the amount of cash in circulation (a liability). The most underreported story in 2018 and so far in 2019 in the fake legacy media. According to the Fed’s QT schedule, the next up for the chopping block will occur on Wednesday the 20th of this month. But that chart adds together everything that expires during a week and reports it as of the subsequent wednesday. So while it lists 23.3B of UST for 20th feb, that unwind can happen anytime in the prior 6 days, from Feb 14th to the 20th, which is consistent with what Wolf says about the unwinds happening on the 15th and the last day of the month. 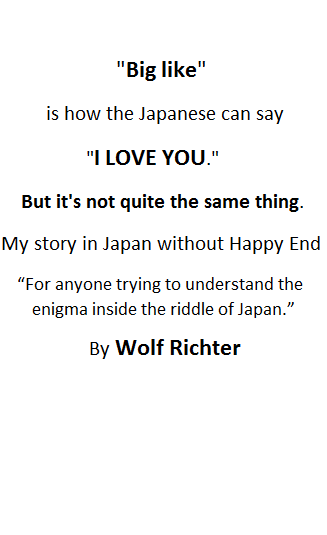 It also lists an unwind for Feb 6th that nearly matches what Wolf says happened on Jan 31st. So I suspect it’s not happening “on” the 20th, just to pick a nit in OutLookingIn’s post, but on Friday the 15th. If the thesis in the article I linked is correct, the stock market is already heading down as a result of this next big unwinding. Or because of failing to break out over the 200dma, or both. Anyway, it may be “look out below” for the next week or so. This cheat sheet will need to be updated since last November and this February (and future months) will have very large SOMA reivestments. Some of them will be in the shorter 2 year to 5 year range and will also add to what is maturing in 2 years or later. Pretty easy to maintain as the note auctions are completely announced and you can just add the SOMA reinvestments amounts to their maturity schedule. The apparent demand collapse, of credit card loans. Joe Sixpack totally tapped out? February is one of the months when the Treasury roll-off maxes out the cap. On Feb 15, $43 billion in Treasuries on the Fed’s balance sheet will mature; and other $12.5 billion will mature on Feb 28. For a total of $55 billion. The cap for Treasuries is $30 billion. If all goes to plan, the Fed will let the $30 billion max roll off, and replace the remaining $25 billion. August 2019 will be the largest maturing and reinvesting. I do not invest (take a break) at these months because the Fed reinvests and competes with the auctions. The next 3 years will do most of the heavy lifting for QT. In short term (within 12 month) the market can run over you even if you get the “fact” right. Manipulating “perception” is the FED policy. FED does NOT have to actually do anything in order to direct the market to run another direction. All they need is to give a talk and spread some words. This is why the market is so dangerous nowadays. If you are a truth seeker, even you find the truth, the path to the truth is infested with a mob that will make a move on all subtle rumors and perceptions being intentionally manipulated by the FED talks. Seek what others are thinking, don’t seek fact is the way to survive. Indeed, Janet Yellen was recently questioned on CNBC, following the recent market tantrum, about her suggestion, while acting Fed Chairman, that QT would be like “watching paint dry”. She said well, that characterization was meant to be “re-assuring” to the market . So, clearly she admitted that she intentionally mislead market participants (i.e. lied) for the purpose of manipulating sentiment. Continue to discuss amongst yourselves your not of this Earth theories. Yellen is in the same category as Greenspan — they no longer matter. And that’s not what she said anyway. She said, “IF…” People forget that part of the clause, even if she did matter. I think that the tech recession and the GFC recession happened a few months after the 1st Fed rate cut. So a rate cut may portend a recession if recent history is a yardstick. One data point is an anecdote, not a yardstick. A yardstick is a reference point against which other things can be evaluated against. I would not like to become a person who dismisses core data because it was not presented to me in word perfect form. Some of the smartest people i know here in the USA cannot construct an English sentence to save their lives. Before the 2008 GFC, the Fed FOMC could manipulate its way using the Fed Funds Rate because that rate was used by banks for borrowing scares reserves so they can meet their required reserves. At the same time, non reserve lending mostly referenced the LIBOR. Today these two– FFR and Libor — influence are waning. As yardsticks they have been replaced by IOER and SOFR respectively. The IOER rate is used more for lending excess reserves and they have so much of that. On the other hand the rate used to price SOFR is the short term T Bill as they are secured by Treasuries. A lot of what you see today is an effort of the Fed to control money — both rate and quantity — of what the shadow banking once did. That’s why they are contemplating a larger balance sheet and have a larger part of the money in-house and in their control. You can see even money market today and Commercial Paper has been gutted by the SEC reform and replaced by government securities. The yardsticks now will be based more and more by the rate set by IOER they call the floor, overnight reverse repo which they call the subfloor and the short term T Bill which is the leaky floor. We need to understand and get used to this new regime. In the last week alone, only about 60 to 83 billion a night was traded in RESERVES — the Fed Funds Rate. Whereas, 900 billion to 1.048 trillion per day was traded in SOFR based in Treasuries. So you have 1.477 trillion of excess reserves trading only 60 billion. Whereas the primary dealers holding about 235 billion trading 1 trillion in Treasuries. You see the imbalance, right? The Fed will try to add Treasuries to have control and therefore monetary policy over this AND the Treasury will set a lot of T Bills and make it the World’s basis for monetary trade. Move over money market. This is MAGA. The World will have to borrow secured by Treasuries. I think you’ve mischaracterized it here, but of course you’re entitled to your opinion. Stay the course on the $50 Billion target but allocate a higher percentage to MBS to encourage (and hopefully achieve) higher long end yields. ReFi the necessary percentage of the Roll Off at a short term lower yield so as not to exceed a $50 Billion monthly unwind ceiling. TARP was our first step into this quagmire and it should be the first mess we address in extracting ourselves from it. After a year of QE Unwind we’ve learned it should be tailored to better fit our economic situation. I see no downside to doing just that. OK. I haven’t understood most of this, including some comments that sound pretty informed. But in my op the Fed is something like the money manager of a spend- thrift movie star or rock star. Nothing the Fed does or does not do with monetary policy can change the end game if the US continues to run ever spiraling deficits. To repeat: when Reagan took office the accumulated DEBT of the US since 1776 was one trillion dollars. This after financing two world wars, plus Korea and Vietnam. Now it’s 22 trillion and the annual deficits are heading over a trillion. The US is adding two hundred years of debt every year and the pace is accelerating. Nick – I agree! No one wants to address the deficit or the debt. How many times was it mentioned in the SOTU or SOTU response? Zero. Bleak! And the Fed will stop paying banks interest on excess reserves, which is what is really raising rates, at taxpayer expense… when? It’s the attention to MBS that’s most interesting. It could be a signal the Fed is done with propping up real estate. I wonder if they hold any CMBS. If not, residential is apparently just as much of a concern as CRE. Hopefully, this returns housing to “a place to live” instead of the current “speculative investment”. i think powell was pretty clever here. even though this blog is all over the rolloff, the average person on the street is completely clueless about the qe issue. they do however pay attention to interest rates. you will never see the term “mbs” in a tweet from pres trump. 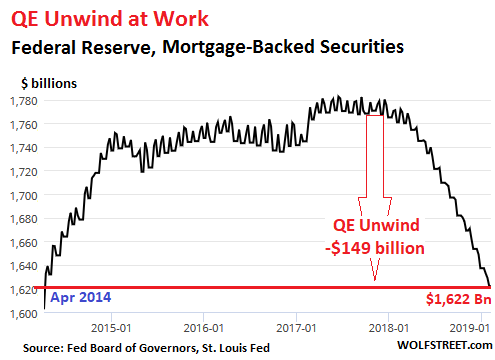 so powell paused on the interest rates to calm the market and the public but he is going to keep fhe pedal to the metal on the qe unwind because no one is watching. Yes he is – Thanks Wolf! One perspective is the fact that US government debt is increasing meaning more treasuries are going to be issued while the Federal Reserve is allowing existing treasuries to mature. This Federal Reserve cash payout is being recycled in the market into new treasuries and other investments. The net result is the transitioning of maturing Federal Reserve treasury payouts into growing US government treasury debt and it looks like the Federal Reserve is working out a way to integrate this process as seamlessly as possible without creating a major disruption in the markets. Wall Street is not very enthusiastic about this maybe because debt is gradually being subjected to actual market forces which hasn’t been the case since QE started. Just look at the gradual increase in interest rates for borrowing on margin. As for the maturing MB securities -is this cash being reinvested in new mortgages or is it going into other types of investments?